Click here to see a short film about Otterton Mill. There has been a working mill at Otterton since at least Norman times, when King William the Conqueror granted all the local land hereabouts to the abbots of St Michel of Normandy. 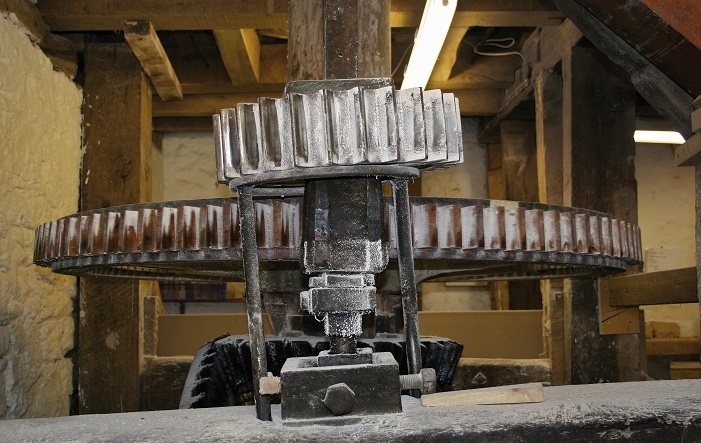 The earliest written record of the mill is in the Domesday survey in 1068. During the middle of the 20th Century, the Mill fell into disrepair, with parts used as a cattle market and slaughterhouse. Milling finally stopped in 1959, after which the buildings were used for grain storage. Fortunately, the mill was lovingly restored in 1977. The business is now in the hands of Chris and Carol Wright, a local family who took over at the end of 2015, and fully committed to preserving the mill for current and future generations. 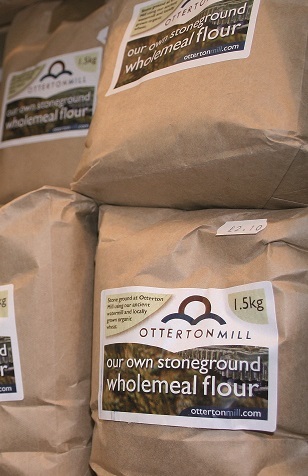 We use waterpower to produce our signature stoneground wholemeal flour, continuing the milling tradition at Otterton. The ancient workings are fully open for public viewing and our millers are always happy to chat to visitors and explain how the mill works. You can even taste the flour, fresh and warm from the flour chute. Open all year, every day from 10am. In our Mill Shop and Gallery, you’ll find a wonderful array of unique gifts, some made by local artisan makers, including glassware and ceramics, handmade jewellery , scarves, candles, all-natural skincare, bags and baskets., plus a great selection of kitchen bakeware, home accessories, walking and cycling maps, and a wide choice of artist-designed greetings cards. 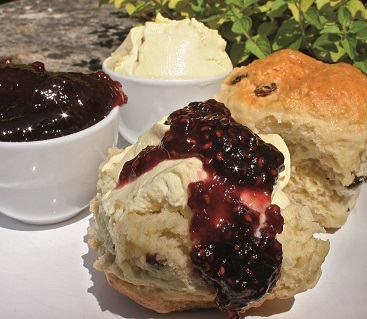 Our award-winning café-restaurant is open daily, for locally produced food, including delights from our bakery and daily, freshly cooked specials, famous cream teas, and outstanding coffee roasted just down-river. We also serve local beers and great wines. We’re delighted to have been awarded our fourth Gold award from Taste of the West.